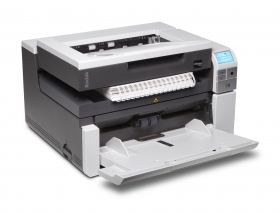 The Kodak i3000 Series Scanners are purpose-built to deliver consistent throughput and minimize downtime for your office. They're loaded with impressive imaging functionality for onboarding of information, and Intelligent Document Protection to defend against damaged documents and lost data. These A3 rotary scanners can take on virtually any challenge while taking up less space on your desk - making them the perfect fit for any business that doesn't have a second to waste. The Kodak i3000 Series delivers consistently high throughput. Whether you're scanning in color or black and white, at 200 or 300 dpi, images, text or mixed-size documents - it doesn't matter, it just gets done. Give productivity a major lift. Stack up the work. With a 250-sheet feeder/elevator you can neatly and efficiently scan large or small batches with ease. Our design ensures continuous throughput with rapid-fire scanning and less risk of jamming. Tear through work, not paper. Intelligent Document Protection is on duty for every document you scan. So scan fearlessly, with the assurance that your documents - and the information they contain - are protected. Kodak's Perfect Page technology optimizes image quality and intelligently manages a host of image processing tasks. It all happens automatically, with every scan. Works incredibly well with others. Built to meet the demands of today and the rigors of tomorrow.